Home > Age Groups > What Toys Are Suitable for Babies? It’s such fun buying baby’s first toys, and toy manufacturers know that! There is a vast array of cot toys, soft toys, highchair toys and practically any kind of baby toy that you can think of, but how do you know if the toy you’ve fallen in love for will be perfect for your little angel? As with all toys, make sure that any baby toys you pick are safe. Check for a CE Mark – although not a consumer safety mark it does indicate that the toy conforms to all the EU safety standards. If the toy has a Lion Mark, that’s even better as it will be safe and of a high standard set by the British Toy and Hobby Association. Check that all baby toys are actually intended for babies! That may sound obvious, but some gorgeous teddies and soft toys may have removable parts that make it not suitable for a baby toy – there should be a warning label if this is the case, indicating that the toy isn’t suitable for a child under the age of 36 months. Babies love to be stimulated by their environment so entertaining cot toys always make good baby toys. Ever popular mobiles, brightly coloured toys that can be attached to the side of a cot and colourful or musical night lights and mirrors can be good choices. Cot toys should always be tied securely to the bars of the cot the risk of avoid suffocation and shouldn’t have any small or removable parts or long strings. Once a baby is able to kneel or stand without help, and can reach a mobile it’s best to take them out, for obvious reasons. There’s so much choice when it comes to baby soft toys and stuffed toys, it can be hard to decide which is the best one for your baby. When you’re looking for baby’s first cuddly toy, first make sure that it isn’t too fluffy and that it doesn’t have anything attached like buttons or eyes that baby could pull away and swallow. If the toy is intended for babies, it should be fine, but it’s best to check for yourself too.Also look out for bows, ties and ribbons that could tangle up and accidentally injure a baby. You can make bath time fun with waterproof baby toys meant for the bath. There’s plenty of variety, depending on what baby likes to do – make a bath a playground with baby toys such as plush baby bath toys that are washable and mildew resistant, and bright plastic toys that can be relied on to cause havoc in the bathroom. 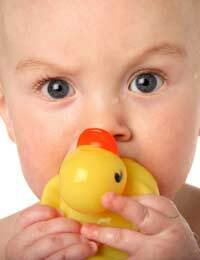 Most baby bath toys are quite simple, but obviously check they are waterproof before subjecting them to the bathroom test! Highchairs area bonus when it comes to keeping baby distracted and safe while you’re busy. But they can get bored – so customise their highchair with some exciting highchair toys and you’ll have a contented baby. Rattles and anything that can be stuck to the highchair and tugged or played with are great fun for small fingers, just make sure that there are no small parts that can come loose and be swallowed while your back is turned!